This Christmas I wrote a poem for mom concerning the home she has lived in and maintained since 1946. What a blessing to have a wonderful place to "come home to"! It's sixty (60) years since we moved in. I was only a year old so I don't remember moving day but I have many, many fond memories of The Old Homestead. Four of the five verses in the poem are written from a different perspective. The first is what you see when you approach the house from the north. The second is coming from the east, the third from the west and the fourth from the south where Little Lake sits. The last verse is a tribute to my mother, of course. Hope you enjoy it. Mom sure did! And shingles that are red. I love that house don’t you! When times weren’t quite so hard. And love from mother’s heart. Your mother's house is absolutely gorgeous! The poem was (as always!) beautiful- what a great gift! My parents still live in the house in Kanata that I grew up in and I couldn't imagine them ever selling it. It's nice to be able to come home to visit and have everything always been just how I remembered it. 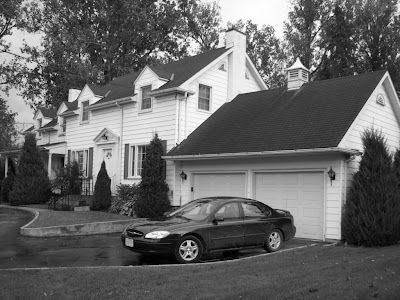 Dear David,,,This house looks like the big white house that my dad rented when he moved to Welland. At the time out of nine children, there were still six kids at home. This was the frist time that each child had a room of their own. The air force houses were so small that two or three kids used to be stuffed into one room each and even at THAT my mom had to make a bedroom out of the dining room so that she and dad would have a room of their own! After my dad retired from the air force and after all the kids were gone, he and mom rented an apartment. You know they never DID own a house David but every Sunday when we go to their apartment for a dinner prepared by my dad, I still feel the comfort of the walls as they surround me. They are laddened with pictures and scripture texts on them that my mom has hung up. And there are bookcases and bookcases flowing over with good books and more than a hundred family photo albums to look at. I guess it is nice to have a house to go back to like you and Lauren-Mary, but it is STILL nice to go home whatever the building is to see your mom and dad.